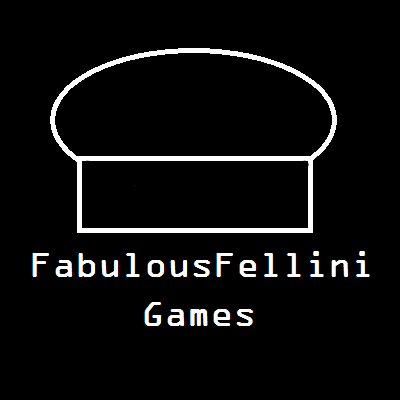 I have decided to build a platformer game for Android. In past posts here on JGO I've stated multiple times (like this, this or even this) that I will never do another game that requires me to design levels but I think that if I limit the number of levels to a ridiculously low number, like nine, I should be fine. So I'm going to call this game Nine Levels, it will be a 2D platformer where the objective is to collect all the collectables (most likely gems or coins) as fast as possible. To add replay-value I'll keep track of the best times and the plan is to also include Google Play leaderboards so that the players can compare their time to other players. I am using libGDX for the game library and Box2D for the physics, not because it is necessarily a good fit for platform physics but becuase I really like it and want to get better at it. For graphics and audio I'll try to find some CC0 licensed assets, which likely will mean I'll turn to Kenney again as he is awesome. I'll try to post somewhat regular updates on my progress here and any comments you guys might have is greatly appreciated. To implement one-way platforms (that is a platform the player can jump up through, but will not fall down through) I hook into the Box2D contact listener. The entities are notified when a contact occurs, at which point they're given the other object and their Fixture that was involved in the contact. The entities are notified when a collision occurs and can tell Box2D to cancel the collision before any collision response have been applied. Using these interfaces the Player entity can check when the collision occurs if it is with a part of the terrain that has been marked as one-way, and if it is, cancel it. It requires a bit of logic to determine if the Player is sufficiently above the platform (in my case 2.5% of the size radius of the player) to enable it, also to allow the player to drop down through a platform on command. I thought it would be tricky to-get one-way platforms to work but it turned out to be a lot easier than dealing with other edge-cases of the implementation. For this project I've opted for a different approach, this time I've applied metadata to the tiles in the tile set used in TileD, and then my level loader reads that and build the physical world from the visual parts. I'm not sure it's a better approach yet but so far it seems to be working Ok and I am getting levels built and tested faster than before. I am using a tile set from an artist called GrafxKid, I think it looks cool and it'll probably be the one I use for the final version. Initially I thought I was going to use a Kenney sprite-sheet and my plan was to make the player jump twice on the little alien guys that Kenney has so many of, first jump to knock off their helmet and the second jump to kill them. I am not sure it's clever to have an NPC that is taller than one tile, but I guess if I design the levels so that they never occupy an area where the available height is just one tile it should be ok.
As this game uses an on-screen joystick and the feel of it is important I wanted to give the player the ability to customize the size a bit. I've added a HUD showing the number of coins left to collect and the elapsed time (the font used was part of the graphics pack I am using for the levels). 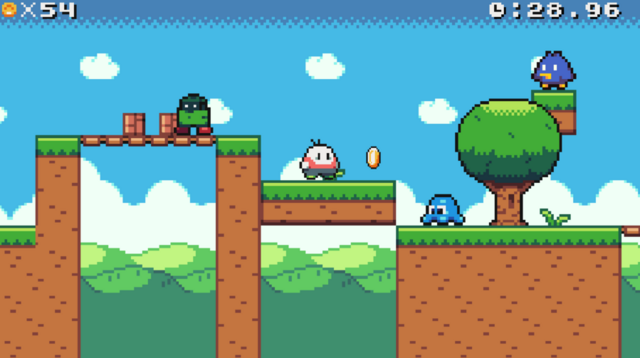 I've also fixed it so that spinning coins are displayed and there's a new type of enemy, a blue slime thingie that right now cannot be destroyed but I am thinking I'll probably make it so it can be jumped on and squashed or something. Next task will probably be different materials for the ground as the tile-set comes with this cool winter theme and I want to have slippery ice in the game. I've added breakable brick blocks that can be destroyed in a very Marioesq manner by jumping into them from below, each consecutive hit earns one coin and after 4 coins the brick breaks, the idea being that it will provide a choice in some situations; either break the brick as soon as it's encountered or use is as a step to reach another place first, then come back and break it. I've also added a new enemy, a bird that sits perched until the player gets close then it starts chasing the player, if it gets really close it dashes towards the player at a slightly higher speed. Next update will be adding music and completing all the levels, after that it's really only Google Play integration for the leaderboards that remain. Thank you, hopefully it shouldn't be that much longer until it's finished. They drop at a configured interval and walk until they hit another Box2D body, they have a set life-span and at the end they stop and explode. The explosion causes a small shockwave that might push the player off a ledge if he/she is close enough. The pumpkins cannot be killed. Good work so far, I like it! Thank you for the feedback @Gornova, it's very much appreciated! Are any of them available somewhere where I can try them? It's very likely I'll disappoint you on both requests I am afraid. When I did Grapple, I found out that I am not very good at creating platform puzzles. In Nine Levels the only puzzle will be figuring out the fastest way to beat the level. As for bosses, initially I hadn't planned on adding any since the game doesn't really progress like a platformer with an over-arching goal (like saving the Princess in Super Mario Brothers). Having said that; I also like to incorporate feedback I get as I post the progress here (which is part of the reason I post about my games), so let me get back to you on that one. I just might add some sort of boss . So progress on this is fairly slow but I'm close to a point where I've got all the levels playable and most (if not all) of the game mechanics done. Leaderboards are mostly done and I've also added an achievement for each level that is unlocked when the level is completed. I'll always have a minute for you. Colder than a walk-in fridge. Is that a popcorn machine? Having completed these means that the game is now feature complete. I'll spend some time testing it and then I'll release it to Google Play. If anyone who's on Android is interested in helping me test this, feel free to send me your gmail address and I'll add you to the list of alpha testers. I've created an attempt at a Google Play store trailer for the game, any feedback you guys might have is greatly appreciated. The recording feels like the game was lagging big time. A little painful to watch actually. I wouldn't recommend using it on the store page. Content wise, It was lovely, but hard to watch. I'm on a crappy old laptop that struggles with capturing at a decent frame-rate, I've created a new version where I've tried to address this to a certain extent. I've also compressed it in time and tried to be more visible about the fact that it is not an auto-runner (so I have more footage of the player running to the left). Thanks for your comment @zngga, I very much appreciate it. All in all imho you should make the trailer a little bit shorter. There are sequences where you are running or collecting coins. And you have seen it some seconds before too. You know most players "have no time" and they dont like repetition. Fair point, I'll cut some parts out and see if I can't get the whole thing to be around45 seconds long. Thank you for the helpful hints, @Apo. This looks like a really nice project, I'm looking forward to see the final product. BTW, the google play link is not working, are you gonna release any alpha/beta version any time soon? I would really like to test it. Thank you! Getting nice comments like this makes it so much more fun to tinker with hobby game development. It's in closed alpha (as in tested by me and my kids , but should go to open beta within thr next couple of days, hopefully. There still a few issues around that need sort first. Again, thanks for the comments I appreciate it. No problem! We are here to learn, share and help the community. If I can help the community I will, if a project gets my interest then I will want to be a tester, if I'm allowed to of course. It's in closed alpha (as in tested by me and my kids Smiley, but should go to open beta within thr next couple of days, hopefully. There still a few issues around that need sort first. Then, I will be waiting. Any comments are as always very much appreciated. I gotta say, so far, so good. The first levels are linear and easy, the controls work, the background music is very good. The only thing I don't like very much is the coin's sound effect, I mean, I like the main sound effect, but the other one I don't. I'm on aloy right now and I'm probably gonna play all the levels during the night, I gotta finish some things first. PS: The game is only gonna have "Nine Levels" right? Thanks, and yes I am going to limit it to nine because I hate level design. Next game is going to have generated levels instead.